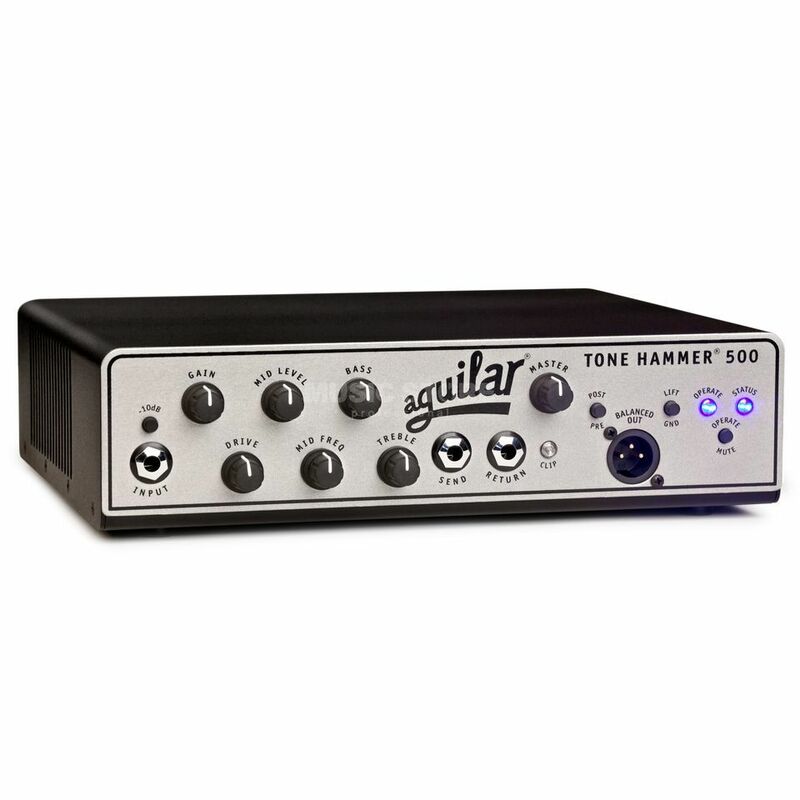 The Aguilar Tone Hammer 500 Bass Guitar Amplifier Head is a lightweight amp head that is based on the popular Tone Hammer preamp pedal. The Aguilar Tone Hammer 500 features a Class D power amp that is capable of pumping out 500 watts of power at 4 Ohms, making it one of the most powerful small amp heads available. This is joined by a solid state preamp, based on the Tone Hammer pedal, that features a three-band EQ with a sweepable mid frequency control. This simple setup allows for a wide range of tonal options to be easily and quickly dialled in. The Aguilar Tone Hammer 500 amp head is also equipped with a fully adjustable Drive section that features the proprietary AGS (Adaptive Gain Shaping) circuit. This circuit adds an extra gain structure and predefined EQ curve to the sound, meaning that a wide range of overdriven, high-gain tones are only a twist of a knob away. The front panel of the Tone Hammer 500 also features an effects loop with 6dB of additional gain and a balanced XLR output with pre/post EQ and ground lift switches, while the rear panel is equipped with a pair of Speakon speaker outputs and a dedicated tuner out.